ESF leaders cut the ribbon - virtually speaking - Tuesday, Oct. 9, on the College's new Digital Storytelling Studio (DSS), a hub for brainstorming, composing and editing digital stories about science and the environment. Dr. Benette Whitmore, chair of the Department of Environmental Studies, joined students, faculty, staff and visitors who were packed into the studio on the first floor of Marshall Hall, for the celebration. 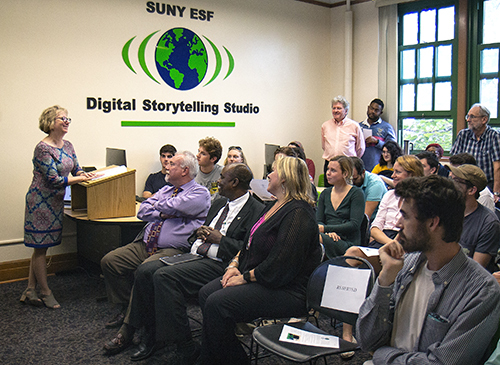 The DSS offers free storytelling services to both students and faculty. The studio offers the loan of audio and visual equipment to support projects such as podcasts, short films, videos, photo montages, story maps, and other hybrid digital media. The studio also serves as a space where students can work on digital projects, and is equipped with four computers and the appropriate editing software. Joining members of the ESF community at the event was Anand Varma, a National Geographic Emerging Explorer and science photographer, who spoke later Tuesday evening to a public audience in the Gateway Center. "With all the data that we have that tells us about how the world works and how it's changing, how is it possible for people to not care?" Varma said. "In my view the answer to that problem is through storytelling." He defined storytelling as structuring information in a way that makes it relatable and makes data meaningful. And he stressed the importance of scientists being better trained to communicate with the public. Interim President Dave Amberg called the DSS "central to the mission of ESF." practitioners in environmental science how to communicate to the public what they do is profound and its profoundly important," he said. "We live in a day when science is being kicked to the curb for things other than science: non-truths, opinions, extrapolations. We have to drown all that discourse out with fact, truth and science-based understanding of the world and what's happening to the world, and we have to turn out people from this College who are adept at explaining what they do and why it's important." "This is huge for the college," Amberg said. "Every university should embrace communicating science. It's a responsibility we all have."